For the next two weeks, the faint glow of the zodiacal light may be visible in the eastern sky just before dawn. What do the prophet Muhammad and Queen’s guitarist Brian May have in common? Look to the sky for the next two weeks for the answer: the zodiacal light. The zodiacal light is a very rare astronomical phenomenon. It is important in Islam because Muhammad used it to describe the times of prayer. Rock guitarist Brian May of Queen, meanwhile, has a doctorate in astronomy for research into (you guessed it) the zodiacal light. For the next couple of weeks, night sky observers will have an excellent opportunity to observe the zodiacal light. We all know about the large bodies that make up the solar system: the sun, the planets and their moons, the asteroids and comets. But there is a lot of interplanetary matter which has never coalesced into large solid bodies. This is mostly dust left over from the original nebula out of which the solar system formed, and it’s concentrated in the plane of the solar system, which is known as the ecliptic or zodiac. At certain times of the year under certain conditions, this thin interplanetary dust can be seen with the naked eye, and the next two weeks present such an opportunity. The first requirement for seeing the zodiacal light is an extremely dark sky. Its glow is much fainter than that of the Milky Way, so that, if you can’t see the Milky Way from your location, you can forget about seeing the zodiacal light. The second requirement is that there be no moon in the night sky. That’s why the next two weeks are so important: the moon will be close to the sun or in the evening sky, leaving the morning sky moonless. The third requirement is that the ecliptic, the line in the sky where the sun, moon, and planets move, be at a high angle to the horizon. This happens in February and March in the western sky after dusk, and in September and October in the eastern sky before dawn. 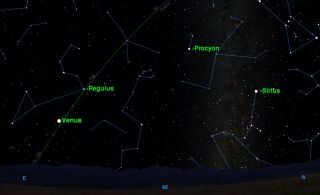 The sky map guide associated with this story shows the eastern sky at 5 a.m. local time this week. The Milky Way appears as a ghostly glow of distant stars rising vertically from the east-southeast horizon, marked by the bright stars Sirius and Procyon. To the Milky Way's left, rising from the eastern horizon at an angle, will be the fainter glow of the sun reflecting off countless particles of interplanetary dust — the zodiacal light. It will follow the path of the ecliptic, marked by Venus and Regulus. You can tell the difference between the zodiacal light and the Milky Way by its position in the sky, by its shape (conical or triangular, rather than a strip of equal width), and by its faintness. To improve your chances of seeing the zodiacal light, be sure to give your eyes at least 20 minutes to adapt to the darkness. For observers in the Southern Hemisphere, the months for best observation are reversed: Dawn in February and March, dusk in September and October.